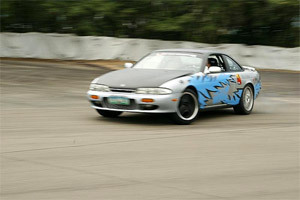 Eleven months ago, I featured here in Vista Pinas the Carmona Circuit. That racing circuit is primarily for karting and motorbike races and can’t support Formula Three type races. Well, the Subic International Raceway (Wikipedia) is one that does and in fact, it was one of the courses regularly visited by the Asian F3 Series together with the Batangas Racing Circuit. The circuit, highlighted in yellow in the satellite image thumbnail, is located right next to the Subic Bay International Airport. Its length is approximately 3 kilometers, runs counterclockwise, surfaced with bitumen (i.e., tarmac), and has a width of 12 to 15 meters. There are around 12 turns in the course and is designated as a Grade 4 circuit by the Fédération Internationale de l’Automobile, which is the governing body of many racing series. Subic International Raceway is operated by Sports Values Inc. and was completed in 1994 through the efforts of local racing legend, the late Pocholo Ramirez, who died of cancer on March 18 of this year. If you want to see a diagram of the circuit, check out the SIR page at the Asian F3 website. The Wikipedia article and the Visit Subic article on SIR would also be good reads if you want to learn more.